I’m attached to my phone. Literally. All of the time. 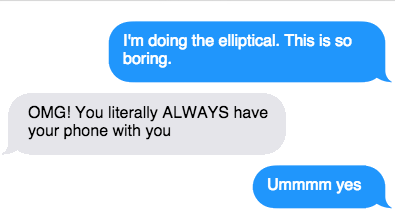 I was texting while on the elliptical machine at the gym yesterday. I take a picture of every meal. I style my morning coffee to get just the right shot for #morningvibes. And then, I put these pictures on Instagram and Facebook….but only after I edit them, of course. A week ago, however, I spent 5 hours with a girl without taking my phone out. Without taking a picture of our entrees and wine glasses at dinner. Without taking a picture of our ice cream night cap. Without even taking a picture of her (and that, friends, would have been the most beautiful picture of all). The truly great moments in life are those that we forget to even get out our phone to document. These are the moments, the experiences, the nights that we all crave. These are the instances that we try to manufacture to then post on social media. Truly great moments can’t be manufactured, though. They just happen. Life happens. With this in mind, I’m trying to make a concerted effort to really live in the moment more often and to avoid manufacturing moments for the sake of social media. Will this be a full-time thing? Absolutely not. However, it will be a true effort to live more organically and let life’s moments happens. And to accept that not everything has to be manufactured, manicured, edited, and then posted to social media with 19 hashtags.